Circus Tent - הירשל ציג'ס בלאג: "הקרלינאים נשארו בטבריה"
Orthodox mob harasses teenage girl in Jerusalem suburb over ‘immodest’ clothing? "On Wednesday evening 150 extremists demonstrated outside of the homes of two families affiliated with the Chabad hasidic movement, demanding that they move out. “They have big dogs that they walk around with in the street, they deliberately chase children with them and frighten them, they intentionally defile this neighborhood and we want them to go somewhere else,"
The red circle is around the wrong person. 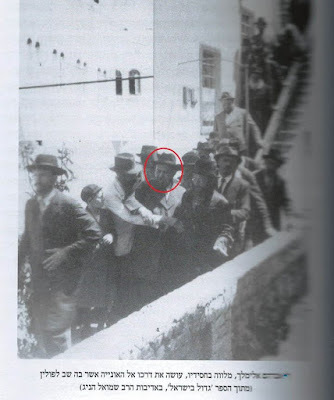 The Rebbe is to the right of him. Anyone see Heilman's new book "Who Shall Lead Us"
Not entirely flattering, but a lot of details not widely known. BTW, was he ever a Ruv in Holon, or did he just live there? Don't Chasidim refer to him as the Cholon'er? PS: Leon Wieseltier, literary editor for the New Republic, criticized Heilman for "behaving like a tribalist"..
New Bobov uber alles! a "million" views on a live "chsidish mitzvah" dance! on the Internet. belz come lately not even on the chart..
Thid mr too rebbe, He supposed to represent his father in law.., a true and truth humble and down to earth pious person in the spirit of Sanz!, not the hucus-pocus Bobover side shtig on steroids. and he supposed to be a 'talmid cuchem' too. he should know better. pop rebbe.